In 1925, Traynor posted a .320 average with six home runs, 106 runs batted in and led the league in fielding percentage as the Pirates won the NL pennant by 8 1⁄2 games over the New York Giants. In the 1925 World Series, he hit .347 including a home run off future Hall of Fame pitcher Walter Johnson as the Pirates defeated the Washington Senators in a seven-game series. Traynor ended the season eighth in Most Valuable Player (MVP) Award balloting. His 41 double plays in 1925 set an NL record for third basemen that stood for 25 years. In a 17-year major league career, Traynor played in 1,941 games, accumulating 2,416 hits in 7,559 at bats for a .320 career batting average along with 58 home runs, 1,273 runs batted in and an on-base percentage of .362. He retired with a .946 fielding percentage. 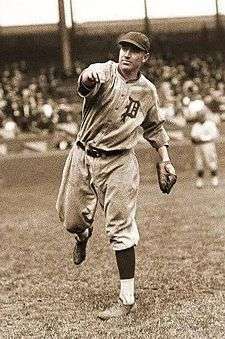 Traynor was not a home run hitter – he reached a high of 12 in 1923 – but had high numbers of doubles and triples, hitting 371 doubles and 164 triples lifetime and leading the league in triples in 1923, with 19. He hit over .300 ten times and had over 100 runs batted in (RBI) in a season seven times. Among major league third basemen, his seven seasons with more than 100 runs batted in is second only to the nine seasons by Mike Schmidt. Chipper Jones is the only other third baseman in history to match Traynor's five consecutive seasons with more than 100 runs batted in. He had 208 hits in 1923, and was the last Pirate infielder with 200 or more hits until shortstop Jack Wilson, who had 201 hits in 2004. He struck out only 278 times in his career. 1 2 3 4 5 6 7 8 9 10 11 12 13 14 15 16 17 18 "Pie Traynor". Baseball Reference. Retrieved October 27, 2010. 1 2 "Pie Traynor at The Baseball Hall of Fame". Baseballhall.org. Retrieved October 27, 2010. 1 2 Kaese, Harold (June 1972). Pie Traynor Greatest of the Third Basemen. Baseball Digest. Retrieved October 27, 2010. 1 2 James, Bill (2001). The Bill James Historical Baseball Abstract. New York: Free Press. p. 554. ISBN 0-684-80697-5. ↑ Birtwell, Roger (September 1969). Pie Traynor Best of All Third Basemen. Baseball Digest. Retrieved October 30, 2010. 1 2 3 "Pie Traynor Minor League Statistics". Baseball Reference. Retrieved October 27, 2010. 1 2 Graham, Frank (October 1954). On Seeing Pie Traynor Again. Baseball Digest. Retrieved October 27, 2010. ↑ "1923 National League Fielding Leaders". Baseball Reference. Retrieved October 30, 2010. ↑ "1925 National League Fielding Leaders". Baseball Reference. Retrieved October 30, 2010. ↑ "1925 World Series". Baseball Reference. Retrieved October 27, 2010. ↑ "Pie Traynor Post-Season Batting Statistics". Baseball Reference. Retrieved October 26, 2010. ↑ "1925 Most Valuable Player Award Balloting Results". Baseball Reference. Retrieved October 27, 2010. ↑ "1927 World Series". Baseball Reference. Retrieved October 30, 2010. ↑ "Baseball Scribes Name All-Stars Of 1927 Season". Beaver Falls Tribune. November 30, 1927. p. 14. Retrieved April 5, 2011. ↑ Hample, Zack (2011). The Baseball: Stunts, Scandals, and Secrets Beneath the Stitches. Knopf Doubleday Publishing Group. p. 123. ISBN 9780307742087. Retrieved August 12, 2016. ↑ "1933 All-Star Game". Baseball Reference. Retrieved October 27, 2010. ↑ "Baseball Stars Meet In 'Game Of Century' At Chicago Tomorrow". The Evening Independent. Associated Press. July 5, 1933. p. 6. Retrieved April 5, 2011. ↑ "1934 All-Star Game". Baseball Reference. Retrieved October 27, 2010. ↑ Third Basemen With Most 100 RBI Seasons. Baseball Digest. January 2009. Retrieved October 30, 2010. ↑ Kuenster, Bob (September 1994). All-Time Best Third Basemen Starred as Hitters, Fielders. Baseball Digest. Retrieved October 27, 2010. ↑ "Career Leaders & Records for Putouts as Third Baseman". Baseball Reference. Retrieved October 31, 2010. ↑ Middlesworth, Hal (October 1960). 17 Years At Third Base!. Baseball Digest. Retrieved October 25, 2010. ↑ "Harold (Pie) Traynor, Veteran Star of the Pittsburgh Pirates, Named Manager to Succeed George Gibson". The St. Petersburg Times. 19 June 1934. p. 8. Retrieved 21 January 2016. ↑ "Pie Traynor Manager Statistics". Baseball Reference. Retrieved October 27, 2010. ↑ "'Homer in the Gloamin'". mlb.com. Retrieved October 27, 2010. ↑ "Pie Traynor New York Times Obituary". TheDeadBallEra.com. Retrieved October 30, 2010. ↑ "Pittsburgh Pirates Retired Numbers". mlb.com. Retrieved October 27, 2010. ↑ "100 Greatest Baseball Players". sportingnews.com. Archived from the original on February 27, 2009. Retrieved October 27, 2010. ↑ "The Major League Baseball All-Century Team". mlb.com. Retrieved October 27, 2010.